My relationship with Israel started before I can remember. Growing up Orthodox, I started learning to read Hebrew at roughly the same time I started learning to read English, although my Hebrew had a decidedly Biblical vocabulary. Gamal (camel), ohel (tent), and elohim (God) are among the first words I learned to read in that curvaceous, inky print. Zionism was inextricable from the Jewish studies curriculum that took up half my school day. We learned the story of God promising Abraham a land and we prayed facing Jerusalem, for the preservation of Israel against its enemies. Every year, I tramped up Fifth Avenue with my schoolmates in the Salute to Israel parade, carrying homespun, glitter-adorned banners. My awareness of the Holocaust—the great cataclysm that had bit branches off so many of our family trees—was from my earliest school days wrapped in the story of the establishment of the Jewish state. My school hewed to the Israeli calendar, which ties the agony of genocide to the ecstasy of self-rule by placing Holocaust Memorial Day and Israeli Independence Day in close proximity. Solemn slide shows of emaciated bodies, and then, days later, joyous, gender-segregated hora dancing in the gym, punctuated every spring. In August we mourned the destruction of the Temple in Jerusalem. I went to a summer camp so ardently Zionist we lined up each Friday and stood at ease or attention when camp officials barked IDF commands in Hebrew. One year, counselors created a mini-golf course decorated with papier-mâché Israeli landmarks. Israel wasn’t just a story in Genesis or a lovingly evoked and distant land; my family visited frequently, nearly every year, most often for Passover. Our visits didn’t resemble the sterile, highly coordinated theater of Birthright trips, but they were gentle on us children. I remember the bright colors of the souk in Jerusalem, running my hands over hot limestone, scribbling notes in childish script to insert in the mossy cracks of the Wailing Wall. I moved through the end of high school in this cocoon, a Zionist and politically conservative milieu so comprehensive and homogenous it lulled me into complacency. I grew up thinking The New York Times was, for reasons I couldn’t understand, far too rough on Israel. It’s only in retrospect that I see the glimmers of violence that managed to pierce even the thick carapace of this idealized Zion. At the Salute to Israel parade, one year, a wild-eyed man with our group shouted: “Shechem—is Israel! Hebron—is Israel! Ramallah—is Israel!” We echoed his chants. I don’t recall how old I was, who he was, but I remember my shiver of discomfort: Even then, I knew Ramallah was where Palestinians lived. In school “the conflict” was occasionally referenced; once, we watched a propaganda film commemorating the death of an Israeli infant, ten-month-old Shalhevet Pass, whose family had been part of a militant settler enclave in Hebron. Accompanied by a swelling orchestral score, the film condemned Palestinian terrorism. One year my family had an unusually luxurious suite in Jerusalem for Passover: Even the grand foreigner-friendly hotels were mostly empty, at the height of the intifada in 2003. But generally what I knew were ripe pomegranates and chopped salad, shawarma wrapped in warm lafa, a whole country that—just like me— ritualistically avoided bread for eight days in spring. Like many Orthodox teenagers, I went to Israel for a year between high school and college; we were sent to the Holy Land in droves, with the hopes of shoring up our religious educations against the coming erosive forces of secular colleges. I went to a small, primarily Israeli seminary in the dry and searing Beit Shean Valley, two hours north of Jerusalem; it occupied a few modest dormitories and trailers on a religious kibbutz. I was meant to learn Torah for twelve hours a day, with brief breaks to eat. In practice, I found my zeal for religious study rapidly exhausted, and spent considerable time in bed. But living in Israel afforded me more than the quick glimpses I could gain on family vacations. I rode Egged buses with Uzi-toting soldiers, and hitchhiked through checkpoints on my own. The Palestinian cars were checked thoroughly; the young soldiers waved through the Jews I rode with without a second glance. The boys I met at the kibbutz’s watering hole were studying Torah as a brief reprieve before donning the same uniform. The most important experience I had was participating in a program called Encounter, which seeks to connect young Jews and future clergy with Palestinian citizens and activists. It took me up close to the border barrier between Israel and the West Bank—and across it. I saw the graffiti—calls for peace in a Babel of languages—and met Palestinian activists who were willing to lecture a group of sheepish, nerdy Jews; I saw a humble backyard bisected by the cruel gray expanse of the wall. Most significantly, I stayed overnight with a Palestinian family. Somehow, we wound up watching Seinfeld—my host liked George Costanza best—and laughing together. In the morning I had spiced labne and jam with their toddler Hassan. And when the bus took us back over, I saw a seemingly endless line of Palestinian workers, travel documents in hand, ready to pass through a checkpoint bristling with guns. There are very few moments in life when a whole mesh of illusions is stripped from you at once. I remember this one very clearly. I realized all of a sudden that the word “Palestinian” had been wrapped very deliberately in layers of hatred all my life. I remembered the racial slurs I’d heard uttered about Arabs in high school, all before I met a single one. I realized I had been taught to view all Palestinians as violent—that it was a shock to find them human, to sit beside them on a couch, to watch TV, break bread and play with their child. I had been taught to see all Palestinians as willing to murder me, to murder a baby, with no provocation, an inferior race of fire-eyed zealots. I had been taught that what was theirs was mine by right. I had not been taught about the violence of the occupation, and that omission was as deliberate as anything else. I had been taught a sequence of beautiful myths, the swelling myths of nationalism, but they were lies—lies of omission, pretty stories with venom at the heart. It felt like being stabbed, to know the people who taught me had deceived me so thoroughly, and had kept me ignorant, on purpose, of so much history. I wish I could say that since then I have evolved significantly, or joined some of my Jewish brethren on the knife’s edge of pro-Palestinian activism. I wish I could tell you I am no longer complacent, that I’ve left all nationalist sentiment behind. But it’s not that simple. For one thing, my twin sister, who joined me in that dusty seminary, moved to Israel six years ago. She lives there with her baby and husband and in-laws; my other sister’s husband is Israeli, too, and his parents live just around the corner from my twin. I still remember the taste of pomegranates, schawarma, lafa from the souk on Ben Yehuda Street. I still speak Hebrew, even if I don’t pray in it any longer. 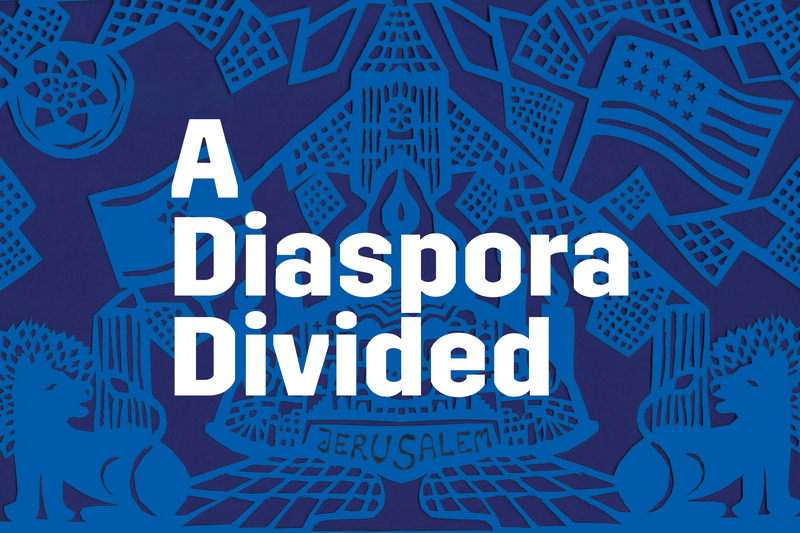 In America, to be a Jew is always to be an “other”; in Israel, it’s thrillingly unremarkable. I’m still steeped in the culture that taught me Palestinian history wasn’t worth learning; I love my family, and the rosy stones of Jerusalem, and I remember the clear pool on the kibbutz where the figs hung low on the water. All I can tell you is that I live uneasily now where Israel is concerned. That I watch Bibi Netanyahu speak in his smooth baritone and I hear the same hate I was raised with; it doesn’t surprise me that he has found kinship with Orban, and with Trump, whose supremacy is based on historical elision and present brutality. I feel compelled to speak out when Israeli strikes murder Gazan civilians. I try to see clearly when just criticism of Israel and Zionism veers into something murkier and more sinister, the ugly rhetoric of anti-Semitism. I wince when the white supremacists I study for a living bring up the Israeli “ethnostate” as proof that their own desires are healthy. And in the face of the new nation-state law in Israel—which limits the “right to national-self determination” in Israel to “the Jewish people,” encourages “Jewish settlement,” and demotes the status of Arabic from an official language—I struggle to refute this argument completely. Life in this seam of unease isn’t simple; I avoid discussion of “the conflict” with my family too often, and with my leftist friends I omit discussions of my Zionist past and my present ambiguities as often as possible. But I have found it is better to live in the pain of not-knowing than to live in a certainty held together by zealous self-righteousness. It is better to live gasping, in my own fretful inadequacy, than sealed off forever in an airless myth.